So Trump’s Disparaging His Own Cabinet Members? He’s borrowing tactics from his hero Andrew Jackson. President Donald Trump has a knack for publically undercutting his own cabinet secretaries and using public statements to pressure them to do what he wants. Over the summer, he tweeted that Attorney General Jeff Sessions was "beleaguered" and “very weak” for recusing himself from the Russian investigation. He said "we'll see" and "time will tell" if Sessions will be dismissed. Recently he tweeted that Secretary of State Rex Tillerson was "wasting his time" trying to negotiate with North Korean leader Kim Jong Un. "Save your energy, Rex," the president said. "We'll do what needs to be done." Tillerson reportedly called Trump a "moron," prompting the president to propose that they both take IO tests. So far, Sessions and Tillerson have both absorbed the disparaging comments and vowed to stay at their posts. A president pressuring and chastising his own cabinet officers sounds unprecedented. 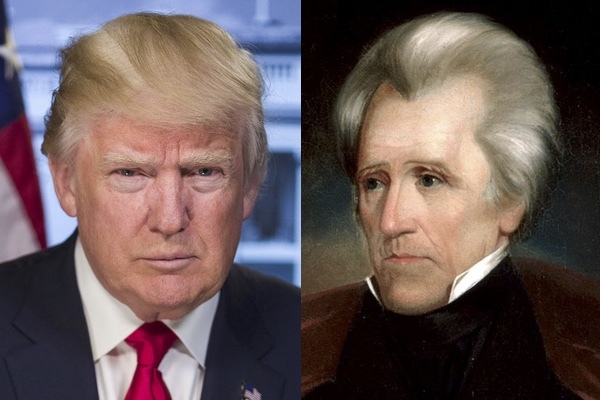 Actually, Trump is borrowing a technique used by one his presidential heroes, Andrew Jackson. Trump sometimes uses his advisor, son-in-law Jared Kushner, for behind-the-scenes diplomacy and negotiations. Jackson used his nephew and advisor, Andrew Jackson Donelson, who actually lived in the White House, in somewhat the same way. Jackson authorized him to screen visitors to the president, serve as envoy for the president on sensitive political issues, and provide policy advice. Jackson was offended when the wives of Vice President John Calhoun and of several cabinet members shunned Margaret Eaton, wife of Secretary of War John Eaton, for allegedly having an affair with John before their marriage. He pressured cabinet members to get their spouses to relent and when they did not, he forced them to resign in 1831 and replaced them with more compliant men. Jackson rewarded Eaton for his patience and forbearance by appointing him Minister to Spain. Jackson assembled a collection of unofficial advisors, including newspaper editors Francis Preston Blair and Francis Kendall, whom he consulted on major political and policy issues. This so-called "Kitchen Cabinet" functioned parallel to the actual cabinet and sometimes seemed to surpass it in influence with the president. But the best example of the president's relations with an important and contentious cabinet member may be Jackson and the Secretary of the Treasury. In 1832, Jackson vetoed a bill to re-charter the second Bank of the United States. Jackson believed the Bank, a private corporation sponsored by the government, unduly benefitted the rich and powerful, supported economic privilege, and exercised clandestine political interference. The Bank's charter did not expire until 1836. Jackson, apprehensive that the Bank might use its political connections to try again for re-charter, determined to hasten its demise by removing government deposits. Treasury Secretary Louis McLane, appointed to the post in 1831 after the cabinet purges that year, had urged Jackson to reform rather than abolish the Bank. But when Jackson ignored his advice, McLane reluctantly supported his boss's veto decision. When Jackson ordered him to begin removal of the deposits, however, McLane refused, asserting that congressional approval would be needed. Unable to convince his Treasury Secretary to act, Jackson eased McLane out by persuading him to accept appointment to the prestigious post of Secretary of State in May 1833. Jackson then appointed William Duane to the Treasury post. Duane, a powerful political leader from Pennsylvania, was known to have reservations about Jackson's removal plans but the president assumed he would change his mind. But once in office, Duane dug in. His reading of the law was that it was up to the Treasury Secretary, not the president, to remove the deposits, and only with congressional approval. Furthermore, he thought removal was bad policy that would "plunge the fiscal concerns of the country" into "chaos." Jackson countered that "my object, sir, is to save the country, and it will be lost if we permit the Bank to exist." Jackson began paving the way by sending Donelson and Kendall out to identify state banks (preferably ones with ties to Jackson's Democratic Party) that would receive the deposits. Duane objected and tried to reason with Jackson. "Providence may change me but it is not in the power of man to do it," the president responded. Jackson had no Twitter, but he did have the Washington Globe, edited by friend and Kitchen Cabinet member Frances Preston Blair, which often presented the administration's views. The Globe singled out Duane for a series of attacks. Confronted by Duane, Jackson denied involvement in the newspaper offensive. But his behind-the-scenes role was clear since, as Jackson biographer Jon Meacham puts it, everyone knew that Jackson was "the master of the Globe." When that didn't work, Jackson offered to appoint Duane as Minister to Russia. Not surprisingly perhaps, Duane did not leap at the opportunity. Early in September 1833, Jackson sent Donelson to tell the embattled Duane that the president was going to announce his decision to remove the deposits in a few days in the Globe. Duane could either concur or resign. He refused to do either. Jackson then dismissed Duane in a short note on September 23. "I feel myself constrained to notify you that your further services as Secretary of the Treasury are no longer required." Jackson was setting a precedent. No previous president had ever fired a cabinet officer. Jackson then appointed his Attorney General, Roger B. Taney, as Treasury Secretary. Taney promptly began removing the deposits as Jackson wanted. President Trump might see the story to this point as a vindication of his own efforts to bend cabinet members to his will. But the story goes on. Duane did not go quietly. He published a book, Narrative and Correspondence Concerning the Removal of the Deposits, and Occurrences Connected Therewith, in 1838. 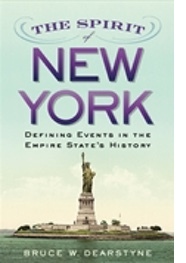 The book included copies of correspondence between Duane and Jackson on the Bank issue and made the case that Duane had been right. It was perhaps the first – and would by no means be the last – book by a disenchanted cabinet member that cast the president in an unfavorable light. Taney's controversial appointment was made while Congress was in recess. When it reconvened, the Senate refused to confirm him in June 1834. Jackson then appointed Secretary of the Navy Levi Woodbury as Treasury Secretary. Woodbury, a former senator and less controversial than either Jackson or Taney, was confirmed by the Senate. But in March 1836, in part as a reward for his loyal service as Treasury Secretary, Jackson appointed Roger Taney Chief Justice of the Supreme Court. By then, Jackson supporters had enough votes in the Senate to confirm Taney. Jackson's Whig opponents in Congress had not been able to muster the votes to override his veto of the Bank charter bill. But they contended that the removal of deposits was illegal, and that Congress, which had to approve cabinet officers, also needed to concur before they could be dismissed. The issues gave Jackson's enemies new energy. The Senate passed a resolution of censure on March 28, 1834. "Resolved, That the President, in the late Executive proceedings in relation to the public revenue, has assumed upon himself authority and power not conferred by the Constitution and laws, but in derogation of both." The Senate was a prestigious body in those days, and the censure motion was a major blow to Jackson. But here, too, in a sense Jackson had the last word. He worked for years to have the censure resolution expunged, finally succeeding in January 1837. By then, his supporters had gained a majority in the Senate but only a couple of months remained in his presidency. Beyond the swirl of controversy, what really counts is policy, and it isn't clear if Trump or his embattled cabinet officers have better policy positions. Historians differ about Jackson's Bank policies. But Secretary McLane may well have been right: reforming the Bank probably would have been better than abolishing it. Secretary Duane was undoubtedly correct in predicting economic disruption from sudden withdrawal of the federal funds, hastening the institution's demise. That was in part the Bank's fault. Its president, Nicholas Biddle, retaliated by calling in loans and restricting credit in the hope of creating a backlash to slow down withdrawals. Business and banking delegations came to the White House to urge Jackson to relent. He refused. "The people! The people, sir, are with me!" he thundered to one visitor. The withdrawal policy continued. The Bank sputtered out of business. Its rapid demise encouraged irresponsible speculation and creation of shaky state banks, which helped plunge the nation into its first major depression in 1837. The story of Jackson's Bank policies suggests that presidents can ultimately bend cabinet officers to their wills or replace them with more pliant people. But what really counts is coherent, effective, carefully thought out policies. Cabinet secretaries are likely to find making good policy quite a challenge when their own president is publically scolding them.